Queen Victoria and Prince Albert on their return from the marriage service at St James's Palace, London, 10 February 1840. Engraved by S Reynolds after F Lock. The lace was designed by William Dyce, head of the then Government School of Design (later known as the Royal College of Art), and mounted on a white satin dress made by Mary Bettans. The plain, cream-coloured satin gown was made from fabric woven in Spitalfields, east London, and trimmed with a deep flounce and trimmings of lace hand-made in Honiton and Beer, in Devon. This demonstrated support for English industry, particularly the cottage industry for lace. The handmade lace motifs were appliquéd onto cotton machine-made net. Orange flower blossoms, a symbol of fertility, also trimmed the dress and made up a wreath, which Victoria wore instead of a tiara over her veil. The veil, which matched the flounce of the dress, was four yards in length and 0.75 yards wide. Victoria's jewellery consisted of a necklace and earrings made up of diamonds presented to her by the Sultan of Turkey, and a sapphire cluster brooch given to her by Albert a day earlier. The slippers she wore matched the white colour of the dress. The train of the dress, carried by her bridesmaids, measured 18 feet (5.5 m) in length. Queen Victoria described her choice of dress in her journal thus: "I wore a white satin dress, with a deep flounce of Honiton lace, an imitation of an old design. My jewels were my Turkish diamond necklace & earrings & dear Albert's beautiful sapphire brooch." While photography existed in 1840, the techniques were not yet fully developed. A series of photographs taken by Roger Fenton on 11 May 1854 of Victoria and Albert are often described as wedding or reenactment photographs, with the dress identified as her wedding dress. The Royal Collection has refuted these interpretations, stating that the images are the first photographs to show Victoria as a queen, rather than as a wife or mother, and that she and Albert are wearing court dress. Victoria revisited the lace-makers to create the christening gown worn by her children, including Albert Edward, the future Edward VII. This gown was worn for the christening of all subsequent Royal babies until the baptism of James, Viscount Severn in 2008, when a replica was used for the first time. As a mark of support for the Honiton industry, in addition to often wearing their lace on her and her children's clothes, Victoria insisted her daughters also order Honiton lace for their wedding dresses. 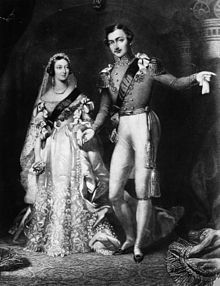 Victoria also wore her wedding lace mounted on the dresses she wore to the christenings of her nine children (except for Albert Edward's, for which she wore her Garter robes). She also wore it to the weddings of two of her children, her eldest daughter, Victoria, in 1858, and her youngest son, Leopold, in 1882. Her youngest daughter, Princess Beatrice, was permitted to wear it as part of her wedding gown in 1885. Victoria also wore the lace to the wedding of her grandson George (the future George V) to Mary of Teck in 1893, and for her Diamond Jubilee official photograph in 1897. When Victoria died, she was buried with her wedding veil over her face. In 2012 it was reported that while the dress itself had been conserved and displayed at Kensington Palace that year, the lace was now too fragile to move from storage. Wearing white was quickly adopted by wealthy, fashionable brides. Less than a decade later, Godey's Lady's Book would incorrectly claim that white wedding gowns were an ancient custom reflecting a bride's virginity, writing "Custom has decided, from the earliest ages, that white is the most fitting hue, whatever may be the material. It is an emblem of the purity and innocence of girlhood, and the unsullied heart she now yields to the chosen one", even though white had been a distinctly uncommon choice for bridal gowns before Victoria's wedding and was not chosen by a majority of brides until decades later. Following the 2011 wedding of Prince William and Catherine Middleton, comparisons were drawn between the bride's white wedding dress and Queen Victoria's own. ^ a b Khalje, Susan (1 May 1997). Bridal couture: fine sewing techniques for wedding gowns and evening wear. Krause Publications Craft. p. 9. ISBN 978-0-8019-8757-1. Retrieved 30 April 2011. ^ Billing, Joanna (2003). The hidden places of Devon (6. ed.). Aldermaston, Berks. : Travel Publishing. p. 17. ISBN 9781902007892. ^ a b c Flock, Elizabeth (29 April 2011). "Queen Victoria was the first to get married in white". Washington Post. Retrieved 30 April 2011. ^ Daniels, Maggie; Carrie Loveless (2012). Wedding Planning and Management. Routledge. pp. 88–89. ISBN 9781136349140. ^ Panton, Kenneth J. (2011). Historical dictionary of the British monarchy. Lanham, Md. : Scarecrow Press. p. 371. ISBN 0810874970. When the couple married at Lund, in Sweden, on 26 October 1406, Philippa (sometimes known as Philippa of England) became the first daughter of an English sovereign to wear a white outfit at her wedding. ^ a b c d Alexander, Hilary (22 April 2011). "How will The Dress measure up to history?". London: telegraph.co.uk. Retrieved 1 May 2011. ^ Lace crafts quarterly. Eunice Sein. 1987. Retrieved 1 May 2011. ^ "Royal weddings in history". Daily Telegraph. Retrieved 11 June 2013. ^ "Queen Victoria and Prince Albert, Buckingham Palace". The Royal Collection. Retrieved 12 June 2013. ^ Jonathan Marsden, ed. (2010). Victoria & Albert: art & love. London: Royal Collection. ISBN 9781905686216. , cited on Roger Fenton. "Queen Victoria and Prince Albert at Buckingham Palace 11 May 1854". Royal Collection Trust. Inventory no. 2906513. ^ a b "Queen Victoria in her wedding dress by John Haslem after Winterhalter, 1848". Royal Collections. ^ Simon Heptinstall (15 June 2008). Devon. Crimson Publishing. pp. 98–. ISBN 978-1-85458-426-7. Retrieved 1 May 2011. ^ "Queen sees grandson's christening". 19 April 2008. BBC News. Retrieved 5 June 2013. ^ a b Munson, Richard Mullen & James (1987). Victoria : portrait of a queen (1. publ. ed.). London: British Broadcasting Corp. p. 75. ISBN 0563204567. ^ Ridley, Jane (2012). Bertie: A Life of Edward VII. Random House. p. 17. ISBN 9781448161119. ^ Lane, John (2011). A Right Royal Feast : Menus from Royal Weddings and History's Greatest Banquets. Newton Abbot: David & Charles. p. 21. ISBN 1446301613. ^ Reid, Michaela (1990). Ask Sir James : Sir James Reid, personal physician to Queen Victoria and physician-in-ordinary to three monarchs. New York, N.Y., U.S.A.: Penguin Books. p. 65. ISBN 0140130241. ^ Bolitho, Hector (1938). Victoria and Albert. Cobden-Sanderson. p. 337. ^ King, Greg (2007). Twilight of splendor : the court of Queen Victoria during her diamond jubilee year. Hoboken, NJ: Wiley. p. 15. ISBN 9780470044391. ^ Hibbert, Christopher (2000). Queen Victoria, a personal history (1st DaCapo Press ed.). Cambridge, MA: Da Capo. p. 497. ISBN 9780306810855. Wikimedia Commons has media related to Wedding dress of Queen Victoria. This page was last edited on 1 March 2019, at 14:49 (UTC).